When their school bus overturns near a strangely deserted carnival, a group of teenagers learns the truth behind the legend of Railroad Jack. In a flashback scene, a sailor trapped by his overturned car pleads for a nearby man to help his wife, who was thrown from the same vehicle. Instead, the man drags the woman away and kills the sailor with a pickaxe. Present Day: Charon High School – Saturday, 8:30am – As punishment for failing to turn in a paper on the Industrial Revolution, Mr. Smith has summoned various students to the high school parking lot. For their makeup assignment, the group is taking a bus trip to the local train station museum for a history lesson on the railroad. Before boarding the bus, Shawn argues with his girlfriend Heather about her pregnancy. Jocks Steven and Andre harass the other students. Sommer arrives with her deaf cousin Maya. Nicknamed “Casper,” albino loner Brian arrives by himself. Overweight misfit Harold is dropped off by his Nana. Jesse is given a ride from her sexually abusive father. Rich brat Trudy Yoo arrives next. As the bus pulls away, Tyler arrives last while being chased by two bullies. On the road, Jesse is the only student to see a man with a pickaxe standing in the desert. At the train station, a man named Mr. Steele teaches the group about the dangers of the railroad and related fatalities. Shawn sees an old photograph of railroad tracks and a figure resembling the description of the man that Jesse saw on the road. A little girl tells Shawn that she also saw that man while on her way to the station. Mr. Steele tells Shawn that the man is Railroad Jack. Seeing Railroad Jack means that he has eyes for you. His love of the railroad transcends time. Although there are some places he cannot go, he has the desire to harvest souls. During the ride home, Railroad Jack appears in the road and the school bus overturns. When the students come to, they realize that Mr. Smith and the bus driver are gone. In the nearby distance, they see a carnival. Eight of the students head towards the carnival to look for help and to enjoy the rides and games while Jesse and Brian stay in the bus. The carnival is completely deserted, but the power is on. The students begin operating the rides themselves and playing the games. Trudy disappears mysteriously from the carousel. Tired of waiting at the bus, Brian leaves Jesse by herself and he heads to the fairgrounds. Steven rebuffs Sommer’s affections, so she rides the Haunted Mansion with Harold. When Sommer avoids his attempt at a kiss, Harold storms out of the dark ride car and wanders the haunted house alone. Tyler showboats from the top of the Ferris wheel. When the ride begins moving on its own, Tyler falls to the ground and is seriously injured. Back in the haunted house, Railroad Jack appears and kills Harold with a pickaxe. Brian enters the haunted house and witnesses Railroad Jack murdering Sommer next. Thinking he was responsible for starting the Ferris wheel, Steven and Shawn confront Brian outside the dark ride. Brian tells them about the man with the pickaxe. The three boys regroup with Andre and Maya when Railroad Jack suddenly appears and kills Brian. Running for their lives, Steven is the next member of the group to die via pickaxe. Railroad Jack also appears outside of the school bus, but Jesse stays inside. Shawn tells Maya that he plans to be a true father to his child with Heather. Railroad Jack corners Andre and kills him. After a struggle with the two remaining teens at the carnival, Railroad Jack murders Maya. As Jack drags Maya’s body away, Shawn sees all of the dead bodies arranged on carousel horses. Shawn starts running back to the bus and then sees paramedics standing over his own body. He realizes that he and the others had already died in the bus accident as Railroad Jack catches up and drags him away. From the bus, Jesse sees Railroad Jack appear as a cowboy. Back in reality, Mr. Smith blames himself for the deaths in the accident. Jesse is rescued, but she is placed in an ambulance whose medic resembles Railroad Jack. It is a gross but fair generalization to blanketly state that high school teens in horror movies nigh pathologically make consistently head scratching decisions. Not only are the teens of “Jack the Reaper” no different, but they are gunning for the championship title of most questionable behavior in the face of fatal danger. After a brief flashback to give the killer his biggest whiff of a backstory, the film moves to a present day Saturday morning in the Charon High School parking lot. A “Breakfast Club” roster of characters then arrives at conveniently staggered intervals that allow each teen to be introduced one at a time. Each of them failed to turn in a paper on the Industrial Revolution, so Mr. Smith has planned a bus trip where the Charon High students will learn local railroad history instead. It stands to reason that the students might be from the same class, seeing as how they all neglected the same assignment. But in addition to not knowing everyone’s names, some of them appear to be laying eyes on each other for the very first time. Luckily for variety’s sake, the group includes a sampler platter of the usual stereotypes: the jocks, a nerdy fat kid, a quiet girl (so quiet that she is actually mute and deaf), a chalk-skinned loner, and the rest. All hair colors and ethnicities are fairly represented as well, making for an ensemble that Benetton would gladly approve. The teens are given their first clue that the day will be stranger than predicted when Tony Todd briefly appears to deliver a cryptic monologue about train-related fatalities and the legend of Railroad Jack. All the exposition needed about the fate lying ahead comes courtesy of Todd’s distinguishable rasp. He warns the students that, with pickaxe in hand, Railroad Jack haunts the local tracks in search of souls to harvest. Seeds of foreshadowing suitably sown, the misfits head home, only to have the sudden sight of Railroad Jack himself throw the driver into a panic as he overturns the bus. When the students regain consciousness, they realize that Mr. Smith and the driver are nowhere in sight. In fact, the only thing that is in sight is a strangely located carnival lighting up the desert night in the distance. Confused, traumatized, and covered with blood, cuts, and bruises, the teens take the only sensible course of action when faced with such a tragic and frightening situation. They point themselves in the carnival’s direction and prepare for a fun night of rides and games. With ten teens total, a relatively high number for a singular group even by slasher standards, logic dictates that the reason behind the double-digit figure is to heighten the kill count. But the first student does not take a pickaxe to the gut until nearly two-thirds of the way into the film. How does “Jack the Reaper” pass the time until bodies start dropping? Ready yourself for a solid 25 minutes of jocks taking turns with a strength tester mallet and smacking into each other with bumper cars. Not exciting enough? Then thrill to a ball race competition for a kewpie doll or a trio of girls spinning around the carousel. Who runs the attractions at this abandoned five-ride carnival in the middle of nowhere? The teens do, of course. Because the smart place to be when injured and trapped in an unknown location is inside the locked cage of a salt and pepper shaker operated by an unknowledgeable 16 year old. It takes so long for anything truly menacing to happen that the perfunctory backstories introduced after the opening credits are forgotten by both the audience and the script. One of the girls has a sexually abusive father. One of the boys just discovered his girlfriend is pregnant. None of these facts have any bearing on the plot, aside from a brief vow later in the film to be a good father, and none of these details make the characters interesting or endearing. 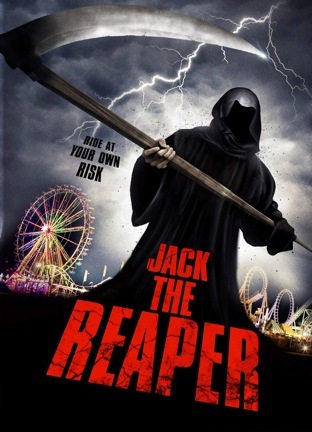 The style of “Jack the Reaper” is as uninteresting as the story. Strange handheld movements and quick micro zooms in and out give a displaced “NYPD Blue” vibe. Shadows are nearly non-extant with each frame completely bathed in the kind of flat, milky light usually seen in shot on video news pieces. A strange female voice-over adds unnecessary narration as a disembodied character that only confuses the film’s loose mythology. The movie name-drops “Prom Night” and “The Hills Have Eyes,” suggesting some kind of genre knowledge that ended up missing from this particular product. Ever since Tobe Hooper’s “The Funhouse,” the dark ride carnival has often been a reliably spooky milieu for horror. Yet even with its own Haunted Mansion ride on premises, “Jack the Reaper” is still devoid of fun as a sideshow-styled terror. Worse still, the weak urban legend running the engine solidifies “Jack the Reaper” as unfulfilling and unsuccessful in everything that it tries to emulate. August 7, 2013 by Ian Sedensky.